Getting the latest electronics design news helps you to keep up with the latest trend in the electronic design world. I am sure you have heard the term "The only thing that is constant is change". This is even more real in the world of electronics and information technology where today's product become obsolete in a matter of months. The constant quest for the better use of energy, environmental friendly products, lower cost products and user-friendly goods are pushing everyone in the electronics industry to design and develop products that meet these criteria. If you have an interesting project that you would like to share with us, you are more than welcome to do so. Just fill in the form at the end of this page and use it to submit the relevant photos or diagrams and we will review them for publication. Now is the opportunity for you to share any interesting news or products to the visitors here. Submit your projects, diagrams and other details using the form below. We will publish it if it meets our guidelines. Have An Interesting Project To Share? 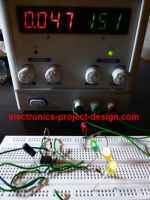 If you have done or built an electronic project that is interesting and workable, please feel free to share with us. You can also share any interesting news on electronics design.